UPDATE - Jan. 24, 2019: I've updated the article to include the top 6 best adjustable dumbbells. If you're trying to build a high quality home gym on a budget, then you'll want the best adjustable dumbbells you can afford. Sure, a full set of fixed dumbbells would be nice. However, you can the same benefits of dumbbell training with a good adjustable dumbbell system, at a fraction of the cost and with a fraction of the space requirements as a fixed dumbbell set. In this article, I'll teach you all about adjustable dumbbells, including their benefits, the different types and what to look for when buying them. Then, I'll lay out my top 6 picks for the best adjustable dumbbells, including the pros and cons of each system. ​​​For my top picks, ​​​​​​​I've chosen to include​ only heavy adjustable dumbbell systems. My criteria is that each dumbbell set must be able to adjust to at least 90 pounds per dumbbell. This can include dumbbell sets that come with a base model that is less than 90 lbs per dumbbell, but which have add-ons that for increase the max capacity. ​I've also included many other​, lighter, dumbbells that didn't make the cut as one of the "best adjustable dumbbells," in a separate section later on this page. Are All Adjustable Dumbbells the Same? Which Adjustable Dumbbell Set Should You Buy? While you may be accustomed to using that long line of dumbbells at your local gym, adjustable dumbbells are far more convenient. Adjustable dumbbells only require you to buy two pieces of equipment, which will save you the hassle of transporting dozens of traditional fixed dumbbells. What’s more, you only need a small corner space to store adjustable dumbbells. 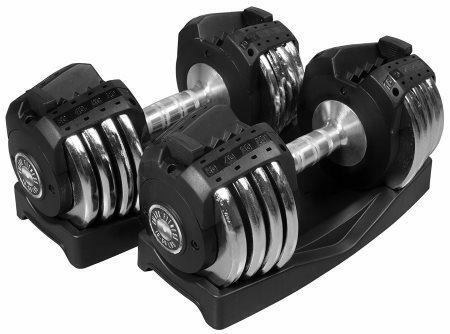 The price of the Rep Fitness 5-100 lb Rubber Hex Dumbbell Set (fixed DBs) is $2379. That doesn't include shipping, which is an extra ~$300+ depending on where you live. The set goes from 5-100 lb dumbbells in 5 lb. increments. This is one of the best bang for your buck sets out there (i.e. good quality, great price). The price of my #1 rated dumbbell, the PowerBlock Elite 5-90 Set is only $557 plus $89 for shipping. It goes from 2.5-90 lbs in 2.5 or 5 lb increments. So, the fixed set in this example is a whopping 400%+ more expensive than the adjustable set! Adjustable dumbbells, unlike most commercial gym dumbbells, are quite different from one another. First, the size and shape of adjustable dumbbells can vary drastically. Some may be top heavy while other brands may balance the weight throughout. Some adjustable dumbbells may have a circular shape while others have a block or boxy shape. You may find that you prefer one size and shape over another so it’s important to take this into consideration. Next, the method in which you change the amount of weight you’re using can be very different depending on the adjustable dumbbell. Some dumbbells have a twist-action change while others have movable pins. Finally, not all adjustable dumbbells are built the same. If you’re someone who tends to get rough with their gym equipment, you’ll want to avoid certain brands of adjustable dumbbells because of their durability. With all of these differences to consider, let’s jump into the top 5 adjustable dumbbells for home gyms. ...They have several different models with different features and weight capacities. The PowerBlock Pro EXP Stage 3 set (purchased in 3 pieces: Stage 1 Set + Stage 2 Kit + Stage 3 Kit) is the most durable and robust PowerBlock you can buy. Unlike the Elite 90, it has a protective urethane coating on the weight blocks. Plus, the weight block rods have a non-welded "flex" design. This makes them MUCH less susceptible to damage from short drops compared to the Elite, which uses an inflexible welded design. They go all the way up to an impressive 90 lbs per hand, just like the Elite 90. They're the only PowerBlock dumbbells that are compatible with the KettleBlock handle, which converts them into an adjustable kettlebell. Similarly, they're the only models that are compatible with the PowerBlock EZ Curl and Straight Bar handles, which convert them into adjustable barbells. 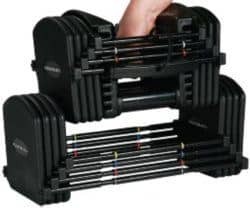 The PowerBlock Pro EXP Stage 3 adjustable dumbbells are more expensive than the Elite 90 set by about $200, which might be out of the budget range for some lifters. 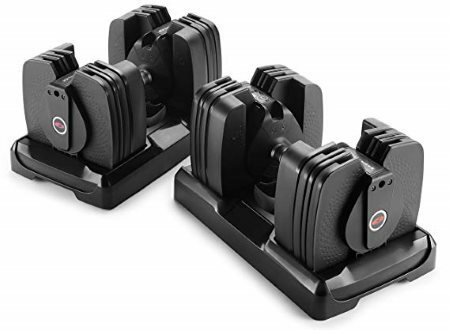 If you’re on a budget that doesn't allow you to get the PowerBlock Pro EXP set, but you still want a proven adjustable dumbbell set with rapid adjustment, then the PowerBlock Elite 90 set are a superb choice. PowerBlock Elite 90 Dumbbell Set: This is the most popular adjustable dumbbell set made by PowerBlock. Easy and quick to adjust, a pair of Elite 90 adjustable dumbbells are maxed-out at 90 pounds, which means that they are going to be ideal for the greatest number of weight lifters regardless of physique goals. In terms of quality, the Elite 90 set was built to take some punishment. Still, I wouldn’t recommend throwing them around as you would with traditional dumbbells. The biggest complaint that you’ll hear about the Elite 90 adjustable dumbbells is that due to their box-like shape they can be awkward to handle. This, of course, can be remedied with time and practice. 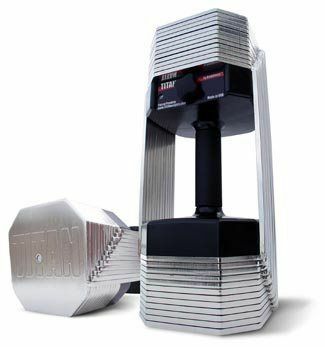 With the ability to max out the weight at 165 pounds per dumbbell and the durability of commercial grade gym equipment, the Ironmaster Quick-Lock Dumbbells are a formidable choice. You can expand them to VERY heavy weights. The base set goes to 75 lbs., which is impressive in and of itself, and adequate for most lifters. Need more weight than that? No problem, just get the 120-lb add-on kit. Is 120 lbs. still too light for you?! Well worry not, there is yet another add-on kit that takes you all the way up to a max weight of 165 lbs.! That's almost the highest you can go for any adjustable dumbbell set. The only one I've seen that can go higher is one of the commercial sets from PowerBlock that goes up to 175 lbs. However, it's also significantly more expensive than the Ironmaster -- And with the Ironmaster, you can start with a much lower investment by getting just the base set, then buy the add-on sets later. This image shows visually how the different add-on kits, when combined with the base set, can be used to expand the maximum weight capacity to 120 lbs. or even a full 165 lbs.! I really like this adjustable dumbbell pair because of the potential that comes with purchasing them. They are a vital tool for any fitness goal and they are built so tough that I believe they are going to last a long time once you make the buy. It comes with the dumbbell stand included in the price of the 75 lb. base set. With most other adjustable dumbbell sets, you have to buy the stand separately. The Ironmaster Quick-Lock Dumbbells aren’t the fastest locking dumbbells. They are much quicker than traditional spin-lock adjustable dumbbells. But they can’t compare to the speed of the PowerBlock or BowFlex brands. At the same time, though, they are more durable than both the PowerBlock and BowFlex dumbbells – you trade adjustment speed for durability. With a weight limit of 90 pounds that you can rapidly spin and set, the Bowflex SelectTech 1090 adjustable dumbbells are a great choice for anyone looking to build a respectable home gym. 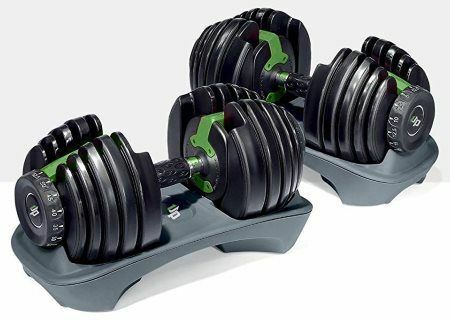 The 1090 dumbbells are reasonably priced for the quality and while not as tough as the Ironmaster dumbbells or even the PowerBlock dumbbells, they’re more durable than most other adjustable dumbbells. While I don’t own the 1090s, I did have the opportunity to train with them before. I found that the handle of the 1090 dumbbells helped me train up my grip strength considerably more than traditional dumbbells, because it’s thicker. This is what you'll get if you buy just the dumbbells. 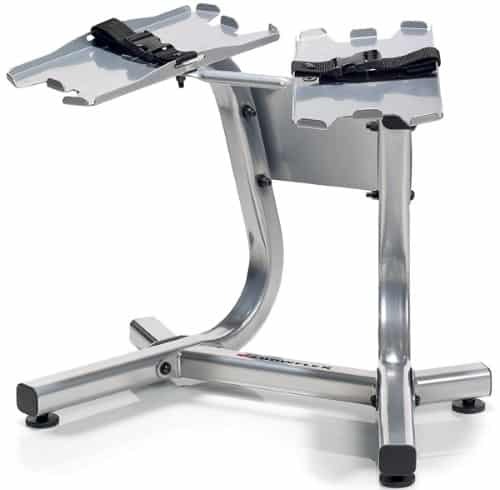 You can buy the Bowflex dumbbell stand separately, or included with the dumbbells. 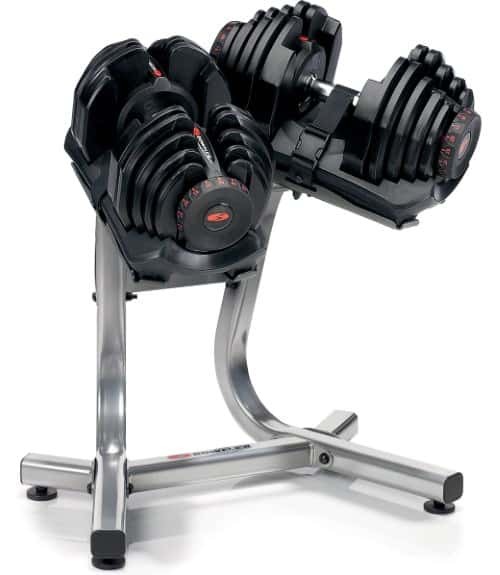 The Bowflex SelectTech 1090 adjustable dumbbells start at a relatively high weight of 10 lbs. This isn't an issue for the vast majority of exercises, but there are times where being able to go as low as 5 lbs. (e.g. rotator cuff exercises like shoulder external rotation and shoulder internal rotations). They are the same length at 10 lbs. as they are at 90 lbs. They don't get shorter/longer as you adjust the weight lower/higher. This can make it awkward to do exercises like biceps curls or lateral raises where you bring the dumbbells to your sides or in front of you -- the long handles may get in the way of your hips or thighs, even when using a relatively weight. When you want the feeling of holding a traditional dumbbell and the option to expand your weight limit to 100 pounds per dumbbell, the 200-pound set of Yes4All Adjustable Dumbbells may be what you need. It's the least expensive set of twist-on collar style adjustable dumbbells I could find that adjust up to 100 pounds per dumbbell. Do not confuse the 200-pound set with the 105-pound version of the Yes4All dumbbells. The 105-pound set only comes with enough weight plates to adjust each dumbbell up to 52.5 pounds per dumbbell. If you're a serious lifters, you're going to want use more than that eventually, on some exercises. ...All of the above just lends itself the 200-pound set being the smartest buy to begin with--even if you don't think you'll need more than 52.5 pounds per dumbbell at first, you will eventually. So you may as well buy it now and save. That is, of course, if you choose Yes4All dumbbells vs the others I mention in this article. The issue that I have with the Yes4All Adjustable Dumbbells is the twisting cap that secures the plates. It is quick to wiggle and become loose. I think this won’t be a problem for the observant lifter but if you tend to get into the zone, you may not realize you’re about to lose some weight plates. 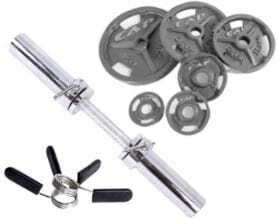 If budget is your main concern when buying adjustable dumbbells, Cap Barbell Olympic Dumbbell Handle with Olympic Weights is a low-cost option that gets the job done. It gives you that old school feel of traditional dumbbells with the Olympic-style plates. 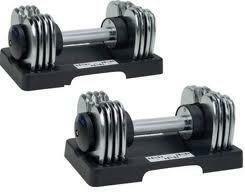 What’s more, you can rest assured that you’re getting a set of dumbbells with a high durability level. Also, if you already have an Olympic weight set already (i.e. plates with 2-inch diameter hole), then you can just buy 2 handles and use your existing weight plates. My concern is with the collars that come with the Cap Barbell Olympic Dumbbell Handle + Olympic Weights. I don’t think they are the best quality and if you’re moving heavy weights above your body, you may be putting yourself at risk. The one remedy to this is to purchase secure and higher quality collars. This isn’t ideal but it may be a necessary solution if you can’t afford the higher priced adjustable dumbbells. 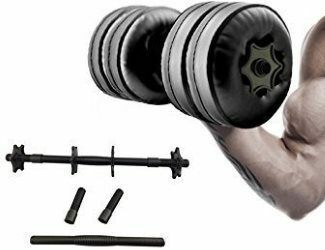 ​In addition to my top picks for the best adjustable dumbbells, above, I​'m also including reviews for dozens more adjustable dumbbells in this section. This is basically ALL of the adjustable dumbbell sets I could find online, as of late 2018. Most are mediocre​ and some are downright terrible​. ​But there are a few good ones mixed in here. Adjusts from 1​1-71.5 lbs per dumbbell. Adjusts in increments of 5.5 lbs (​2.5 kg). Weight is shown in kilograms; not pounds. ​Very rapid adjustment; you​ only have to adjust dial from one end, instead of ​from both ends. Goes all the way up to 71.5 lbs per ​dumbbell, which is impressively high especially considering the relatively low price point. You can​ buy a stand bundled with the dumbbells​​, ​or you can buy ​a stand separately later. Read my full Merax Deluxe Adjustable Dumbbells Review for more information. ​Adjust​s from ​10-​55 lbs per dumbbell. ​Adjusts in increments of 5​ lbs ​when adjusting both ends evenly. However, you can adjust just one end to get increments of as little as 2.5 lbs; the weight distribution will be slightly uneven, but you can just ​shift your grip position ​​a bit to ​balance it out. Comes standard with a sturdy, sleek-looking stand with built-in adjustment trays. ​One of the most "natural" adjustable dumbbell designs. It has a very similar look and feel to a traditional fixed dumbbell​. Read my full MX S​elect MX55 ​Adjustable Dumbbells Review for more information. ​Adjusts from 5-52.5 lbs​ per dumbbell​. Adjusts in 2.5 lb increments from 5-25 lbs. Then it adjusts in 5 lb increments from 25-50 lbs. The last increment is 2.5 lbs., from 50-52.5 lbs. All of these increments are for when the weight on the dumbbell is evenly balanced. Since you adjust each side of the dumbbell independently, you can technically cut these increments in half if you're okay with the weight being slightly imbalanced toward one side. This means you could get 2.5 lb increments in the 25-50 lbs range (e.g. if you wanted 27.5 lbs, you'd adjust one side to 25 lbs and the other side to 30 lbs). Similarly, you could get as little as 1.25 lb increments in the 5-25 lbs range (e.g. if you wanted 21.25 lbs, you'd adjust one side to 20 lbs and the other side to 22.5 lbs). Admittedly, there's no practical situation where you'd need a 1.25 lb increment when dealing with already light weights, but hey, it's possible. The 2.5 lb increment possibility in the higher weight range of 25-50 lbs has more practical applications. Comes with dumbbell storage trays. There is also a dumbbell stand available which you can buy bundled with the dumbbell set or you can buy it separately​. Overall, the Bowflex 552 dumbbells are very well balanced. They're perfectly balanced from side to side. From top to bottom, they have good balance for their dial-based selectorized design, but it's not perfect. All dial-based selectorized dumbbells have a cut-out gap in each weight plates on the top side of the dumbbells, which is needed so the handle can be inserted into the center of the plates. This design causes some degree of imbalance between the top and bottom of the dumbbells. Bowflex managed to minimize this imbalance by keeping the gaps as small as possible, in addition to making the bottom sides of the plates flat. Still, on heavier weights, you may notice that they're slightly bottom heavy. They may feel like they're trying to rotate down depending on how you're holding them. To mitigate this, make sure the dumbbells are in the same position in both hands. Also, have the dumbbells oriented so that the gap part is either facing straight up or straight down, relative to the dumbbell path on whichever exercise you're doing. For most people most of the time, this won't be a noticeable issue since the effect is so subtle. The handle shape is contoured, being thickest (1.5" diameter) in the center and narrower toward each end. The handle material is metal, though it's mostly covered by a texturized rubber grip portion where you grasp the handle. The metal shows on either side of this grip. Unfortunately, it's a common complaint that this rubber grip will eventually loosen and shift/rotate slightly around the handle during use; though it typically takes a while for this to occur. Adjusts in 2.5 lb increments from 5-25 lbs. Then it adjusts in 5 lb increments from 25-60 lbs. The weight is evenly distributed between the left and right side for all increments. It's not possible to unevenly load one side of the dumbbell, since you can't adjust each side independently. Comes with dumbbell storage trays. There is also a dumbbell stand available that you can buy separately​ to put the trays and dumbbells on for easier access. Adjustment is rapid; slightly faster than with the dial mechanisms on the other Bowflex Models (i.e. 552, 1090). The 560's adjustment mechanism is to simply turn the handle to the desired weight. Generally, there are very few complaints about this adjustment mechanism. For most people, it seems to always work quickly and smoothly. I ready only one or two reviews mentioning that it would occasionally get stuck. When adjusting the weight, you can see the amount in two places: on an analog indicator/dial and on the built-in digital screen. Unfortunately, the numbers on the analog indicator are printed very small and will be hard to read if you have poor vision. The digital screen has large text, but you'll likely have to turn it on each time by pressing the button since it shuts off automatically after a minute to conserve battery. Additionally, the digital screen is only on one of the two dumbbells. 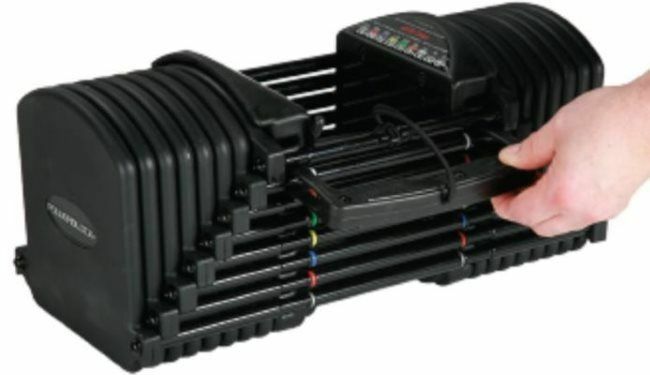 One of the most disappointing things I found out when researching the Bowflex 560 dumbbells is that they had originally announced that they were planning an upgrade kit that would make EACH dumbbell expandable up to 100 lbs​! That WOULD have been awesome. It would have made it a much more viable option for serious lifters. Unfortunately, they never followed through with the plan for whatever reason. Apparently, many people bought the 560s when they first launched based on the promise of this upgrade kit being available in the future, only to be disappointed when it never came out. I'm sure Bowflex had their reasons canceling, but it's still not a good look on their part. Many owners have had trouble pairing the dumbbell with their phone to use the app. You have to wait 10 seconds before every set for the app to be ready to start counting reps. This adds up to a significant amount of wasted time throughout your workout. Many report that the app isn't user friendly. Even if it were easier to use, much of the app's utility is more targeted toward beginners or non-serious lifters. In terms of tracking reps, sets and total weight lifted, it's decently accurate. Around 90% accurate. However, if/when it does mess up, it requires manual intervention, which ultimately adds time to your workout. It's up to you whether this is better than just counting reps in your head, then writing it down in a workout app or notebook. Considering the high premium you pay for this technology, the functionality certainly wouldn't be worth it for me. The handle is metal with a texturized rubber grip over the center. The handle has a very slightly contoured shape, being thickest in the center and gradually becoming narrower toward the ends. Dumbbell length is 14 inches regardless of the weight selected. The Core Fitness adjustable dumbbells have the same exact design as the StairMaster TwistLock adjustable dumbbells, which are increasingly difficult to find in stock online. It appears that the company that owns StairMaster (Core Health & Fitness) is rebranding the same dumbbell design under the name of "Core Fitness." Luckily, these retail at a MUCH lower price than the StairMaster branded version did (i.e. ~$600 for the StairMaster vs. ~$300 for the Core Fitness the last time I checked). Adjusts from 5-50 lbs per dumbbell. Adjust in 5 lb increments. The weight is distributed evenly between the left and right side at every weight setting. This is in contrast to some dumbbells where the weight can be adjusted asymmetrically. They come with a tray to store and adjust each dumbbell in. 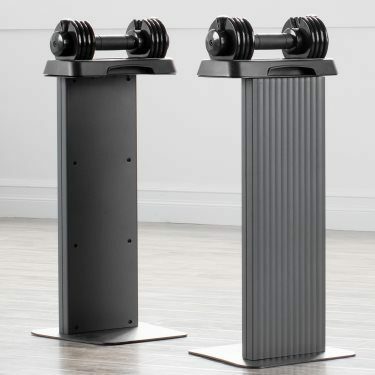 There is a well-made and reasonably priced dumbbell stand made for the Core Fitness adjustable dumbbells, which is sold separately (there's also this one), which is the exact same but with "StairMaster" branding). You don't need it per se, but I always recommend some type of stand for any adjustable dumbbell system, since it put trays and dumbbells at a convenient height for racking and unracking, so you don't have to pick them up from the floor each time. Incredibly easy and fast adjustment. The "TwistLock" adjustment mechanism only requires one hand to adjust weight. You just grasp the handle and twist it to the desired weight setting, then lift it out of the cradle. This video shows how simple it is. The ends of the dumbbells are flat. This is thanks to the adjustment mechanism being built into the handle instead of on the end of the dumbbell like with the dial-based adjustable dumbbells. Having flat dumbbell ends makes the dumbbells look and feel more like traditional fixed dumbbells. Importantly, you can balance the dumbbells vertically on your thighs without any discomfort when setting up for exercises like shoulder press or bench press. Overall, these are very well balanced dumbbells. As mentioned previously, they're perfectly balanced between the left and right side at every weight increment. They're also well balanced between the top and the bottom of the dumbbells, since the adjustment mechanism is completely contained within the center of the dumbbell. This means the plates are just like regular plates; they don't need notches cut into them for a large handle to be inserted in (i.e. like with the Bowflex/dial-based systems), which would make them somewhat bottom heavy. The plates are round except for part of the bottom which is flattened out. This allows you to set them down without them rolling away. But at the same time you still get the traditional dumbbell look of (mostly) round plates. Most adjustable dumbbells, especially the selectorized ones, have some amount of rattling. With the Core Fitness adjustable dumbbells, rattling is minimal. I only came across two customer reviews discussing rattling and both said that it was minor. I read some feedback from another customer who said there was no rattling at all even when doing fast movements. If the plates do rattle at all for you, the noise will be dampened thanks to the plastic coating over the plates compared to other sets have cast iron plate shitting into each other. The dumbbells have a variable length, meaning they're shortest at their lightest weight and they become longer as you add more weight. The dumbbell length at the lightest setting of 5 lbs (i.e. just the handle) is a mere 9 3/8 inches. The dumbbell length is 14.5 inches at its max weight of 50 lbs. This is impressively compact for adjustable dumbbells. I'd say this is one of the biggest benefits of this dumbbell set, along with the rapid "TwistLock" changing. Handle is contoured; thicker in the middle, tapering toward each end. There is a rubberized coating over handle to improve comfort and grip quality. ​The Bayou Fitness dumbbells ​adjust​ from 10-50 lbs per hand. ​They're sold as a pair​, though you could buy just a single dumbbell here​. The smallest adjustment increment where the weight will be evenly distributed between the left and right side, is 10 lbs. That's definitely on the high side compared to most other adjustable dumbbell sets. However, since each side of the dumbbell is adjustable independently, you can achieve as little as 5 lb increments, but one side will be heavier than the other. In this case, you would have to adjust your grip slightly to one side to balance it out. It comes with trays to store and adjust the dumbbells in. There is no dumbbell stand available, with it or sold separately. However, if you wanted one, you get one from another brand. Adjusts using a sliding pin mechanism. You pull the pin up, slide it to the correct setting and then allow the spring inside the pin to pull it back down into place. Many people report that the pin mechanism gets stuck often and can take a good amount of force to get unstuck. Others report that you can fix or avoid this problem by applying some oil (e.g. WD-40) to the pin to lubricate it. Some people have said that the pin may eventually come lose and could possibly fall out, which would mean the weights could just fall off. This would be something you'd want to check periodically, and if it's loose, tighten it ASAP. Only a few of the many Bayou Fitness adjustable dumbbell reviews mentioned anything about rattling. The consensus seems to be that the rattling is very minimal. It's mostly happens when doing more rapid movements, or when taking the dumbbells out of the tray and putting them back in. When they do rattle, it's more noticeable because the plates are metal and thus louder than coated plates would be. That said, they feel quite stable during use, which is important for performance and safety. Has a straight, metal, knurled handle. This is great and preferable to a contoured and/or rubberized handle because it lasts longer, feels more natural and provides better grip. The dumbbell is the same length at all weight settings. It does not expand or contract in length as you add or remove weight. The dumbbell length is 14 1/4 inches. Adjusts from 5-25 lbs per dumbbell. Adjusts in 5 lb increments if you want the weight evenly balanced between the left and right side. However, if you need 2.5 lb increments for some weights, you can adjust one side to the next highest setting, but the weight will be 2.5 lbs heavier on that side. In this scenario, you'd just have to shift your grip position to even out the imbalance. Same exact dumbbell as the Weider SpeedWeight-PowerSwitch set. The only difference is the branding and that the ProForm version is sold as a single dumbbell, whereas the Weider version is sold as a pair. Comes with a tray for storing and adjusting the dumbbell in. The dumbbells apparently fit well into these. However, some owners have reported that after a few weeks or months of use, the dumbbells began sticking to the tray when pulling them out. This could possibly be something to do with the chrome paint used on the plates, though I couldn't say for sure. Adjusts using a sliding pin mechanism. You pull the small metal pin up, slide it to the desired weight setting and then allow the spring inside the pin to pull it back down into place. The pin can be difficult to move. It will occasionally jam when adjusting the weight, and you need to slide it back and forth a couple times to get it to lock into the selected weight setting. This likely can be fixed, or at least improved, with some lubrication (i.e. WD-40). One ​owner mentioned that the weights can become loose over time, which could eventually lead to the plates falling off during use. To prevent this, you should monitor them. If they seem to be getting looser, use an Alan wrench to tighten the screw on each end of the dumbbell. As with any adjustable dumbbell design with notched plates, the dumbbell may feel slightly bottom-heavy. The weights rattle somewhat, but it's not a major complaint. It will make some noise though since the plates are metal. If you let the plates become loose (see above), then the plates will rattle more and become louder. Straight, metal handle with knurling through entire grip area. Dumbbell length is the same at every weight setting. Dumbbell length is 13 inches. 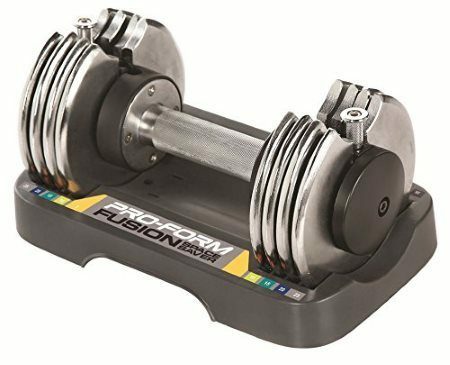 This is the same exact dumbbell as the ProForm Fusion SpaceSaver set. The only difference is the branding and that th​is Weider version is sold as a pair, whereas the ProForm version is sold as a single dumbbell. Adjusts using a metal pin mechanism. You pull the pin up, slide it to the correct setting and then allow the spring inside the pin to pull it back down into place. Dumbbell length is not variable; it is the same length at every weight setting. ​The basic design is very similar to the Weider Select-A-Weight Adjustable Dumbbell Set, which I discuss in the section below​. The main differences are in the branding and that the Weider version only goes from 10 to 50 lbs in 10 lb increments, whereas the NordicTrack version goes from 10 to 55 lbs. in as little as 2.5-5 lb increments thanks to a secondary micro-adjustment feature. Adjusts between 10-55 lbs per dumbbell. Adjusts in increments as low as 2.5 lbs for most weight settings, or as low as 5 lbs. for some weight settings -- specifically, the possible weight settings include: 10, 12.5, 15, 20, 22.5, 25, 30, 32.5, 35, 40, 42,5, 45, 50, 52.5, and 55 lbs. The cool thing is that even with these tiny increments, the weight will be distributed evenly between the left and right side. For most adjustable dumbbells, 2.5 lb increments are only possible if you add the weight to just one side; thus making the dumbbell slightly unbalanced. However, on the NordicTrack Select-A-Weight dumbbell set, this is made possible by a secondary micro-adjustment feature built into the handle, which I'll explain in-depth later. NOTE: It also appears that you can adjust each side independently with the sliding pin mechanism (but not the micro-adjustment mechanism), which may mean you could get even smaller increments on some weight settings, though the weight would be unevenly distributed between the left and right side. Includes trays for dumbbell storage and adjustment. There aren't any stands manufactured specifically for these dumbbells, but you could buy a generic stand from another company. The NordicTrack Select-A-Weight adjustable dumbbells use a sliding pin adjustment mechanism as the primary adjustment mechanism. You pull the pin up, slide it to the desired weight and let it lock back into the plates on the new setting. It should be noted that this mechanism is different from the traditional sliding pin dumbbells in that the pin is not contained within a fixed-length dumbbell handle enclosure. Rather, the position of where you set the pin determines where the end of the dumbbell is. Each increment when using this primary adjustment mechanism is 10 lbs. As mentioned previously, there is also a secondary adjustment mechanism that allows you to do micro-adjustments of 2.5 or 5 lbs. To use it, you press a button then rotate the ring to 2.5 or 5 lbs. This selects one or both of the 1.25 lb micro plates encased within the first large plate on each side of the dumbbell. Due to the way the large weights and the micro-weights add up, there are only a few 2.5 lb increments that aren't available, including: 17.5, 27.5, 37.5 and 47.5 lbs. All others are available. From what I've seen in video demonstrations and reading customer reviews, the sliding pin adjustment mechanism works smoother than the traditional sliding pin design (e.g. like on the Bayou Fitness set). However, there are also a number of reviews that I read complaining about the the NordicTrack's sliding pin jamming, particularly after several weeks or months of use. Others have said their set has experienced no problems even after long-term use. It's possible that the problem could caused by not having all the plates settled into the bottom of the tray before adjusting. It could also be some part that wears too quickly, poor quality control leading to a higher chance of getting a faulty set. Or maybe the users who had the issues misused or damaged their dumbbells. It's impossible to know. In addition to complaints about the sliding pin jamming for some users, other complaints included the that sometimes the plates would occasionally stuck (not just the pin). Also, multiple ​customers commented that some of the little plastic/rubber covers on the plates fell off. Assuming the plates are adjusted to the same setting on each end, the dumbbells will be perfectly balanced between the left and right side. However, I read feedback from one user who complained that they were slightly imbalanced between the top and bottom; specifically that they were a bit bottom heavy. This is common for any adjustable dumbbell system with notches/gaps in the top of the plates to make room for the adjustment mechanism and/or handle. In the case of these NordicTrack dumbbells, they have the notches in the top to allow for the pin the slide through them. There is little to no rattling during normal use. If there is any rattling at all, it would be during very rapid or jerky movements; even then, any noise from the would be minimal since the plates are plastic coated. The handle is made of a hard plastic. It has a contoured shape, being thickest in the center of and narrower toward the ends. There are two narrow bands of texturized lines grooved into the handle where the pinky and index finger would grasp onto. These grooves are meant to enhance grip. However, one ​customer commented that the handles were still too smooth, and became noticeably slippery when sweating. Length is variable, being more compact at lower weights and longer at higher weights. ​The basic design is very similar to the NordicTrack Select-A-Weight Adjustable Dumbbell Set, discussed above​. The main differences are in the branding and that the NordicTrack version go from 10 to 55 lbs. in as little as 2.5 lb increments (thanks to a secondary micro-adjustment feature), whereas the Weider one dumbbells go from 10 to 50 lbs. Each dumbbell adjusts from 10-50 lbs. Adjustment increments are 10 lbs. for weights that are evenly distributed between the left and right side. However, since each side of the dumbbell is adjusted independently, you can achieve increments as small as 5 lbs. by going one increment higher on one of the sides (e.g. 10 lbs on one side and 20 lbs on the other = 15 lbs total). However, you'll need to adjust your grip to counteract the imbalance. Comes with trays for dumbbell storage and adjusting. There is no dumbbell stand made specifically for these, though you could easily find a third party one. These Weider Select-a-Weight adjustable dumbbells use a sliding pin adjustment mechanism. It's the exact same as the primary adjustment mechanism in the NordicTrack set, described above​. Chances are it that it works similarly -- that is, it generally works more smoothly than the "traditional" sliding pin dumbbells, but is still prone to jamming for some users if the plates aren't aligned correctly in the trays, or for unknown reasons after longer-term use. The Weider Select-a-Weight dumbbells, like the NordicTrack version, are going to be well balanced between the left and right side (when the sliders on each side are set to same weight). However, they're going to be slightly bottom heavy since the plates have notches on the top to make room for the pin to slide. Little to no rattling during use. 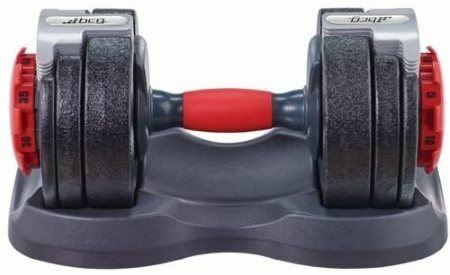 The dumbbells have a hard plastic handle with a contoured shape (thickest in the center, narrower toward the sides). There are two bands of grooving in the plastic where the pinky and index finger would line up, for better. Since it's the same handle as the NordicTrack version, it's fair to assume it also could use more grip enhancing features to reduce slipperiness from sweat. Length is variable; it's shorter at lower weights and longer at higher weights. ​Adjusts from 5-50 lbs per dumbbell. Adjusts in increments of 10 lbs if you adjust both sides to the same weight setting. However, you can technically get 5 lb increments by adjusting the sides unevenly; for example, if you set one side to 20 lbs and the other side to the next highest setting of 30 lbs, the dumbbells will weight 25 lbs. However, they'll be 5 lbs heavier on one side, so you'll have to adjust your grip accordingly if you want to do that. 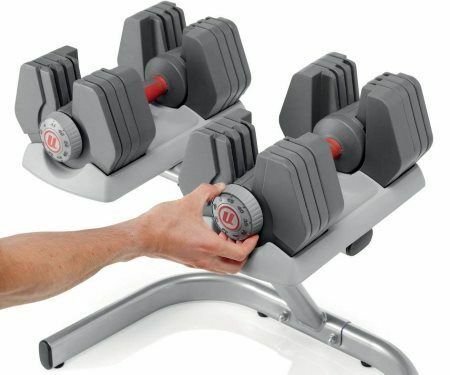 These XMark adjustable dumbbells use a sliding pin adjustment mechanism. The part of pin that you grab is a black plastic tab. This plastic tab is easier to grab than the small metal pins on other sliding pin adjustable dumbbells, which can sometimes be hard to move because you have to pinch the small pin with just your fingertips. Although the tab is easier to grab on the XMark system, it is very prone to jamming when pulling it out and when sliding it. It's common to have to jiggle it and move it back and forth to get it move to the desired setting. Difficulty adjusting was a top complaint with this dumbbell set. The trays seem to be poorly molded. Probably the most frequent complaint I saw was that it was a real struggle to put the dumbbells in the the trays such that the plates are ALL the way into the slots. You have to wiggle and jam them in each time. If you don't, you can't properly adjust them. Similarly, once you get the dumbbells in to the tray slots, the tray sticks on to the plates. You sometimes have to hold the tray down with your other hand so you don't pick up the tray with the dumbbell. Many people have reported that plates will fall off of the dumbbells -- not while in use, but after adjusting and removing them from the tray. This is likely the result of the plates being ALL the way down into the tray when adjusting. These plates rattle a lot and feel wobbly during use. The noise from the rattling is particularly noticeable since the plates are metals as opposed to rubber- or plastic-coated plates. The dumbbell handle is made from steel. It has a slightly contoured shape, where it is thickest in the middle and becomes thinner at each end. There are six narrow bands of knurling spaced over the handle for enhanced grip. It would've been nice for the entire grip area to be knurled, instead of breaking it up like this. But some knurling is better than none, and I appreciate that they used steel for the handle instead instead of plastic. The dumbbell length is the same regardless of the weight selected. Each dumbbell comes with a storage tray. There is no dumbbell stand available specifically for the 1UP. 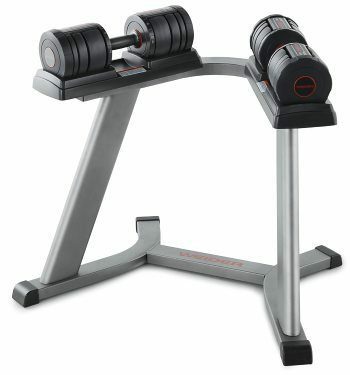 However, since the dumbbells are a copycat of the Bowflex 552, you could buy the Bowflex stand instead​. This appears to be a complete copy-cat of the Bowflex 552 adjustable dumbbell set in terms of everything except the coloring and brand. 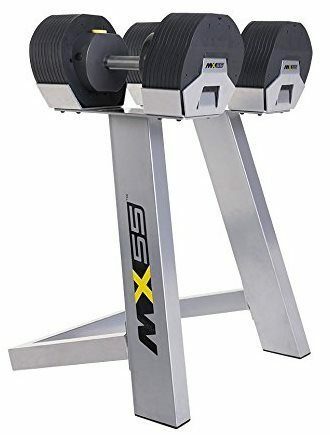 I would avoid this one and instead go with the Bowflex version since it has more and better reviews, a 2 year warranty vs. a 1 year warranty, a well known brand. Plus, the price is almost the same as the 1UP (e.g. approx $10 more for a pair of the Bowflex vs buy 2 of the single 1UP dumbbells). Even though there are only a few reviews available to read, I saw multiple complaining of poor construction quality and defects. Adjusts in 2.5 lb increments from 5-25 lbs. Then it adjusts in 5 lb increments from 25-50 lbs. Then the last increment is 2.5 from 50-52.5 lbs. As with the Bowflex 552, you can technically get 2.5 lb increments in the 25-50 lbs range and 1.25 lb increments in the 5-25 lbs range, since the dials on each end of the dumbbell are independently adjustable. So you can get these smaller increments by putting one end at a higher weight setting and the other end at one setting lower (e.g. set one end at 30 lbs and one end at 25 lbs to get 27.5 lbs). The caveat is that the weight will be slightly imbalanced between the left and right side. Like the Bowflex 552s, these will also be balanced well from side to side, with a very slight imbalance from top to bottom due to the cut-out gap in each plate. The handle shape is contoured, being thickest (1.5" diameter) in the center and narrower toward each end. The handle material is metal, though it's mostly covered by a texturized rubber grip portion where you grasp the handle. The metal shows on either side of this grip. As with the Bowflex 552, the same issue is bound to occur with the grip on the 1UP -- that is, it will eventually loosen and slip slightly during use. ​Adjusts from 5-52.5 lbs per dumbbell. The increments are 2.5 lbs for 5-25 lbs, 5 lbs for 25-50 lbs and 2.5 again for the last setting of 50-52.5 lbs. As with the Bowflex 552 and the 1UP, you can technically get 2.5 lb and 1.25 lb increments for the 25-50 lbs and 5-25 lbs ranges, respectively. This is possible because the dials on each dumbbell end select the weight independently of each other. To get these halved increments, you'd select a higher weight setting on one of the dials, and then select the next lowest setting on the other dial (e.g. set one end to 30 lbs and the other end to 25 lbs to get 27.5 lbs). If you do that, though, the weight will be slightly heavier on one side. You'll have to adjust your grip position accordingly. Sold as a single dumbbell, not as a pair. Comes with a tray to store and adjust the dumbbell. There's no dedicated dumbbell stand made for these, though it would work with the BowFlex stand. 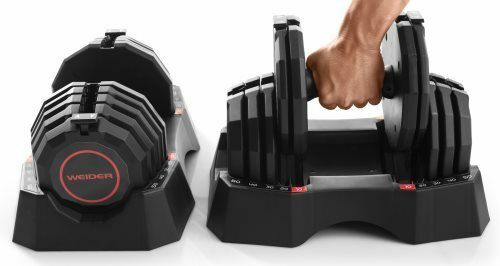 These dumbbells are a rip-off of the Bowflex 552 design, just like the 1UP's discussed above. Everything about it appears to be a complete clone except the branding and colors. If you look up the company, the site is for a Chinese manufacturing company that doesn't even specialize in fitness equipment. So, it's a good bet that these could be shoddily made. The adjustment mechanism is the same as the Bowflex 552s: selectorized with large dials on each end that you turn to select the desired weight. 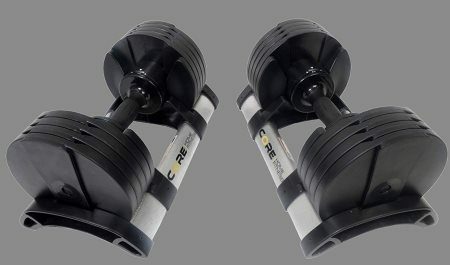 Like the Bowflex 552 and 1UP, the Rainbowtex dumbbells should also have good balance between the left and right side. In terms of top to bottom balance, there will inevitably be some imbalance due to the nature of their design with the cut-out gaps in each plate on the top side of the dumbbells. That said, the imbalance is quite minor in practical terms. The handle contoured, being thickest in the middle and tapering toward the ends. The handle is metal with texturized rubber over the grip portion. It's the same as the Bowflex 552 and the 1UP, and so you'd eventually run into the problem where the rubber grip loosens and shifts around while in use. Available in black/yellow and black/red. You'd think that a copycat product would be at least somewhat less expensive than the original. After all, there's no other reason to take the risk on a no-name company who's quality is probably lower. Well, that's not the case here. 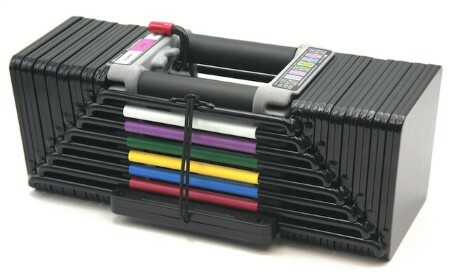 As of now, the Rainbowtex set is MUCH more expensive than the Bowflex 552 set. 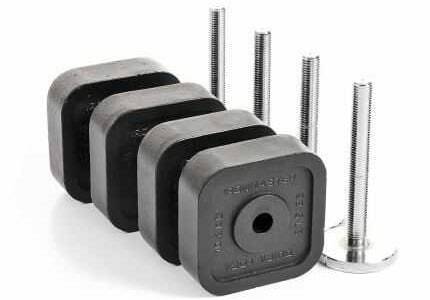 A single Rainbowtex dumbbell costs almost DOUBLE that of a full pair of Bowflex 552s. So there's no reason to entertain these. I just wanted to include them on this page in case anyone reading this was considering them. Each dumbbell is 15.75 inches long. Dumbbell length is the same regardless of the weight selected. The product page claims that it adjusts in 5 lb increments. However, this means that you will be adjusting just one side of the dumbbell, and it will be slightly uneven; you'll have to adjust your hand position slightly to counterbalance it. For the dumbbell to be balanced, the increments are 10 lbs. Sold as either a single dumbbell OR as a pair. Make sure that you select the right option if you get this one. Each dumbbell comes with it's own storage tray. There's no dumbbell stand available specifically for this dumbbell, though you could get one from a different brand if you wanted. Available for sale as a pair of dumbbells or as a single dumbbell. These dumbbells will inevitably be somewhat bottom-heavy. This is the same issue as any adjustable dumbbells with notches cut into the top of the plates (for the adjustable handle to insert into). That said, I didn't come across any customer feedback discussing this point in particular, so it's probably a more subtle imbalance. The plates may sometimes stick to the tray, so you just have to make sure you pull them straight out. Apparently, the dials are sensitive and can turn too easily. So make sure you don't accidentally touch the dial, particularly when taking them out of the trays. I didn't see any reviews mentioning rattling of the plates. However, just about every other dumbbells set with a similar design will have some wobbliness or rattling associated with it. Chances are that it's minimal on this particular set, which is of course a good thing. The outside of the handle is rubberized with a bunch of tiny bumps over it to enhance grip. It's not clear whether it is metal or hard plastic underneath the rubberized portion. If I had to guess, I would say it's metal, simply because the entire handle is relatively heavy at 10 lbs. In term so of shape, the handle is straight; there's no contouring/tapering going on, which I prefer. It's apparently on the thicker side in terms of diameter, though I wasn't able to find an exact measurement. The length of the dumbbell is the same regardless of if it's 10 lbs or 50 lbs. Just like any other sets with the similar dial adjustment mechanism. Dumbbell length is 16 inches, which is pretty long for a 50 lb adjustable dumbbells. 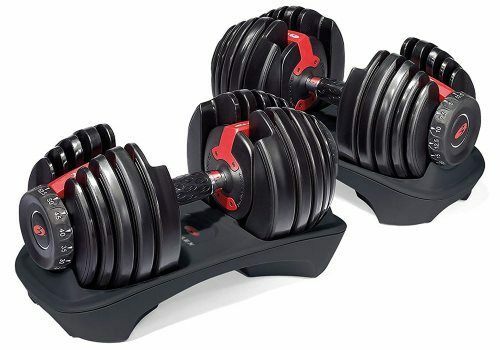 The Bowflex 552 dumbbells are also considered to be long, but they're actually slightly shorter at 15 3/4 inches despite having a higher max capacity (52.5 vs 50 lbs). Overall, the Stamina X Versa-Bell dumbbells are decent in terms of function and quality for this type of design and weight capacity. However, they're currently way too expensive for what you get. You can get the Bowflex 552 for about $80 less, and they're better in every category. The Stamina X dumbbell set has been almost 10 years, so I'm thinking that it used to be a better deal than the Bowflex 552 in the past. That has obviously changed since. ​Adjusts from 5-40 lbs per dumbbell. Adjusts in 5 lbs increments. Though, you can technically adjust it in 2.5 lb increments by adding or removing the 2.5 plate on just one side; it would just be slightly off-balance so you'd have to adjust your hand position accordingly. Comes with a tray to store and adjust the dumbbells in. There's no additional dumbbell stand available specifically for this dumbbell set. It has the typical selectorized adjustment mechanism with large dials on the ends. You turn each dial to the amount of weight indicated on the dial, then remove the dumbbell. Some people report that the weights periodically get stuck and you have to tap or jiggle the dial to make sure it is in the exact position to release. There have been complaints of the small plates falling off. This is not what you want to happen during workouts for obvious reasons. One user said he fixed the problem by tightening a screw under the dial. However, you shouldn't have to do that. The handle is contoured, being thickest in the middle, and tapering toward the ends. It has a rubber grip around the center portion where you grasp the handle. The handle itself appears to be plastic. Plastic handles by themselves aren't necessarily bad, but considering the low price and the dumbbell's lackluster features/specs, this is an indication of a low quality set. The dumbbell length is the same at 5 lbs as it at 40 lbs. As with any other dumbbell with the same adjustment mechanism, it doesn't have a variable length. Overall, I wouldn't recommend this dumbbell. However, if you have your reasons for wanting it, I'd ​be sure to check ​AcademySports, since it may be cheaper than on​ Amazon​ because it is almost half the price there, currently. Although not stated, I can deduce it adjusts in 1 lb increments -- Since if it starts at 1 lb, that means that is the weight of just handle itself. Then there are 10 other pieces in total (8 plates + 2 end lock/screw). We can assume those are 1 lb. each as well. It should also be noted, that at some weights, there will be one pound extra on one side than on the other. There is no dumbbell storage tray or stand included or otherwise available for the Maha dumbbells. I'm assuming that the adjustment mechanism is end locks with a long threaded part that actually screw INTO the handle. To adjust the weight, you'd have to unscrew the ends, and add or remove the plates manually, then secure the ends again. Assuming I got the adjustment mechanism correct (see above), then we can also assume the length of the dumbbell is variable. That is, it gets shorter with less weight and longer with more weight. The handle is metal, straight (not contoured) and has knurling through almost all of it's length. They got this part of the dumbbell right! The price is way too expensive for what you get in my opinion. Not to mention, the max weight is EXTREMELY low. As I mentioned above, the only reason I included this one is because it was unique and looked cool with the different colored plates. Adjusts in 5 lb increments for weight settings where the weight is equally distributed between the left and right side. However, you can adjust the left and right side independently to achieve 2.5 lb increments, but the weight will be unevenly distributed. For example, if you wanted 17.5 lb dumbbell, you'd put the left end of the dumbbell to 15 lbs and the right side to 20 lbs. Then, you'd just shift you hand slightly to the right so to offset the imbalance. Has a sliding pin adjustment mechanism. You pull the pin up, slide it back or forward to the desired weight, then let the pin's spring pull it back down to lock the weights in place. 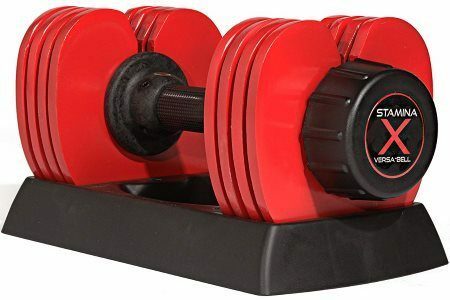 This set of Sunny Health & Fitness dumbbells suffers from the same issue that many other sliding pin adjustable dumbbells face: The pin gets stuck and requires extra time and effort to pull it up and slide it. Lubricating the pin with WD-40 would likely improve this. Includes trays for storing and adjusting the dumbbells in. A buyer complained that the plastic these are made of is cheap and flimsy, as his trays cracked or broke off in several places during shipping. Looking at the product photos, it's apparent these trays aren't reinforced well. One customer complaint is particularly worrying about this dumbbell set -- The hex nut that's on each end of the dumbbell came loose and fell off one of the ends. This nut secures the adjustment mechanism unit. Apparently, the dumbbell stopped adjusting on that side after that, rendering it useless. In a worse case scenario, though, the plates could have fallen off while it was in use. The dumbbell handle is steel, straight (not contoured) in shape and it has knurling throughout the grip area. Dumbbell stays the same length regardless of the amount of weight selected due the nature of the sliding pin adjustment mechanism design. Dumbbell length is 12 inches. NOTE: This is a KickStarter project and it appears it still hasn't been made -- They met their goal, but from what I could find by looking into it for a bit, they've had ongoing issues with manufacturers and trying to get refunds to their backers. Who knows if it'll ever be available to the public, but it's a unique adjustable dumbbell concept that's at least worth mentioning. Each set includes one dumbbell and one kettlebell, with weights that fit both. The dumbbell can go from 5-30 lbs. The kettlebell can go from 15-45 lbs. This is pretty light, so it's not for the strength oriented crowd. Though there's surely other markets for it. 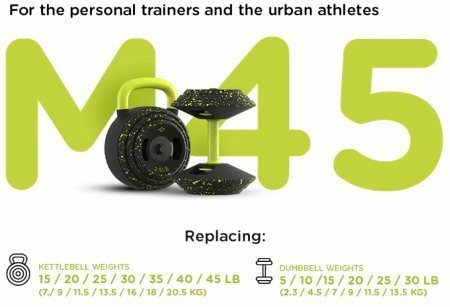 The Kickstarter page seems to imply the adjustment increments for both the dumbbell and kettlebell are 5 lbs. However, it has 2.5 plates that can be added at any point, so unless I'm missing something the actual increments are 2.5 lbs. Though for the dumbbells, of course, if you add 2.5 to just one side, it will be slightly unbalanced. Both the dumbbell and kettlebell use the same "Click&Turn" adjustment mechanism. The handle ends and each plate, has a knob-like protrusion on one side. The opposite side of the each plate can interlock onto to this by fitting into it, and then rotating the plate until locked in place. It's not rapid adjustment since you have to add each plate separately, but it's faster than, say, spin-lock dumbbells. The one standout feature is how compact it is in terms of storage. Everything fits into the kettlebell when it's all packed up. That includes the dumbbell handle, which fits right into a cut-out out area in the core of the kettlebell. Nifty stuff. The handle appears to be plastic. It is straight (not contoured) and has a scored texture for added grip. The length of the dumbbell as well as the kettlebell is variable; it increases with heavier weight and decreases with lighter weight. ​Adjusts from 2.5-12.5 lbs per dumbbell. Adjusts in 2.5 lb increments (it looks like you could do 1.25 lb increments if you adjust just one side, though it would be slightly unbalanced). Comes with trays to store/adjust the dumbbells in. It also comes with a sleek looking stand to hold each of the trays. Has a straight handle (not contoured). The entire length of the handle is padded. Based on other versions of this model I've seen, it is likely solid steel underneath the padding. 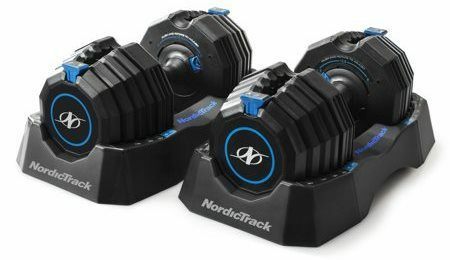 These Nordictrack dumbbell use a sliding pin mechanism, which is generally a very simple and fast adjustment method. You just pull up the pin and slide it to the desired weight. Then do the same for the opposite side of the dumbbell. Other dumbbells with the same mechanisms commonly have issues with this pin sometimes jamming up or being hard to move. However, from the reviews I read on this, I haven't heard that complaint (that said, they were on Nordictrack's website, so any negatives may have been scrubbed). In any case, if that were to happen, some WD-40 lubricant on the pin mechanism would likely solve the problem. The length of the dumbbell is fixed. It's the same length with no weight added as it is with all the weight added. Adjusts from 5-30 lbs per dumbbell. Adjusts in 5 lb increments assuming you want the weight evenly distributed on both sides of the dumbbell. However, if you're okay with a slightly uneven weight distribution, you can adjust in as small as 2.5 lb increments by simply adding or removing a plate from just one side. Includes trays for storing and adjusting the dumbbells. Based on limited reviews, there were complaints about these trays being particularly flimsy and easy to damage. No stand is included or available separately. The adjustment mechanism is odd...or "unique" if I'm to be charitable. Let me try to explain -- The weight plates have triangular holes in the center (as opposed to the typical circular holes). This is so that they can fit on the ends of the dumbbell handle, which are triangular in shape and made of plastic. You manually load the plates on and off. Once you have the desired weight on the handle, you turn the knob at each end of the dumbbell. This causes plastic separators to come out of slits on the handle ends. These separators are spaced evenly so that they line up in between each plate, separating them from eachother and preventing them from falling of the dumbbell handle altogether. This is far from what I would call an elegant solution. You maybe save a few seconds compared to adjusting with a traditional spin lock adjustable dumbbell system. But at the same time, the chances of you breaking the Gold's Gym set is exponentially higher since it has a lot of moving plastic pieces; whereas, traditional spinlock dumbbells are all steel and much harder to damage. The handle is straight; not contoured. The entire grip area is steel with knurling throughout. This is probably the best feature of this dumbbell set, which isn't saying much. The length is the same regardless of weight, meaning the dumbbell is as long at 5 lbs as it is maxed out at 30 lbs. The length spec listed on the Walmart product page is 16.5 inches. I want to doubt the accuracy of this spec, since that would be insanely long for a dumbbell with a max weight of 30 lbs; for comparison, the Bowflex 552 is only 15 3/4 inches long and it maxes out at 52.5 lbs. However, the 16.5 inch spec may very well be correct, by looking at the product photos. The loadable handle area is quite long, with the knobs taking up additional room. Plus, the plates have a lot of empty space inside of them because of they way whey were molded. This means they're deeper and take up a lot more room on the dumbbell handle than if they were compressed/flat in terms of shape. 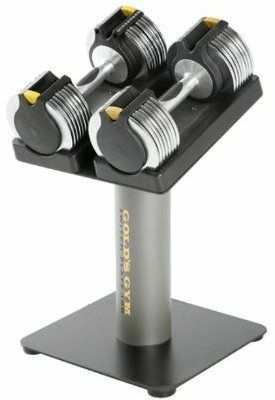 So even if these Gold's Gym Speedlock dumbbells aren't the full 16.5 inches, they're still much longer than you want. Especially because this is a very light dumbbell set in terms of max weight capacity. Having an excessively long length is most problematic with lighter weights; and for these dumbbells, even their max weight of 30 lbs is considered a light weight. ​Adjusts from 10-50 lbs per dumbbell. Adjusts in 5 lb increments. It appears as if you could adjust in 2.5 lb increments by adjusting just one side, but you'd have an extra plate on that side, making it slightly off-balance. 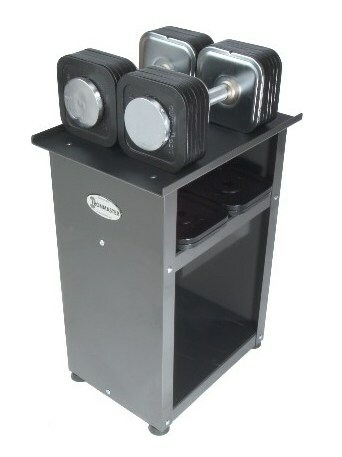 Comes with trays to store and adjust the dumbbells in, as well as a dumbbell stand that's made to hold trays so the dumbbells are at a convenient height to rack and unrack the dumbbells. Uses a sliding pin adjustment mechanism. This similar to the "sliding pin" mechanism mentioned previously. The main difference is that the pin on these dumbbells has a larger yellow tab that allows you to grab it more easily. Whereas on most other sliding pin dumbbells, the pin is smaller and you have to basically pinch it with just your fingertips in order to move it, which can make it especially difficult to move if the pin gets stuck, which happens often on the these types of dumbbells. On the Gold's Gym Switch Plate 100 dumbbells, in particular, there were multiple complaints about the pin mechanism. However, their complaints weren't that it got stuck when trying to pull it out or slide it -- But rather, that they sometimes have issues locking into their new position after you slide them. Some people say you can just attempt to slide the pin back and attempt to reinsert it again and it will eventually fall into place; others say you have to jiggle the dumbbells themselves to get it to lock in. It appears one major issue contributing to the pin getting stuck or plates not getting locked in, is that the holes in the center of the plates are inconsistently sized, causing issues with the locking mechanism. Some people were able to fix this by rearranging the order of the plates on each dumbbell end so that were all on center with the locking mechanism. That shouldn't be something that the user should have worry about, but it's a flaw and seems to be the solution. 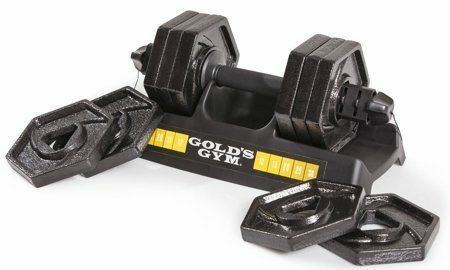 The most common complaint about the Gold's Gym Switch Plate 100 Adjustable Dumbbells is that unselected plates can stick to the selected plates when taking the dumbbells out of the tray. From what I gather, there are a couple possible causes to this: 1.) The lifter is removing dumbbells at a slight angle instead of straight out, which causes plates to catch; 2.) The plates come with some kind of a sticky residue on them from the factory; some users lubed the plates with WD-40 and that solved the problem right away. Some people said this problem goes away after a few workouts without having to make any changes, while for others it persists. The plates rattle together during use. Considering the plates are metal, it will make some noise. And in terms of performance, it may cause the dumbbell to feel slightly unstable in your hand while lifting due to the momentum generated from the shifting plates. The handle is steel and very slightly contoured (slightly thicker in the middle, and a bit narrower toward the ends). It has a large rubber grip insert on in an ellipse-like shape on one side of the dumbbell. The handle is 1.5 inches in diameter at its thickest point, which is larger than the typical 1 inch diameter, so you'll get a bit more of a grip workout with these. Dumbbell stays the same length regardless of the amount of weight selected. ​Each dumbbell adjusts from 4-45 lbs. Adjusts in increments of 5 lbs. You can't adjust one side unevenly to get 2.5 lb increments like on the Bowflex 552. This is because the knobs on the Universal 445 do NOT work independently of each other. Comes with a dumbbell stand that has the weight storage/adjustment trays built into it. It has a dial-based selectorized adjustment mechanism with large dials on either end of the dumbbell. You turn the dial to the desired weight and then lift it out of the tray. The BIG difference between this type of dial mechanism and the similar kind on the Bowflex 552, is that you only have to adjust ONE side; not both. That makes adjustment twice as fast. The only downside of having to turn one dial instead of two, is that you don't have access to the 2.5 or 1.25 lbs increments as mentioned above -- But in my opinion, that's not a huge deal, since the weight would be unevenly balanced if you could; plus, 5 lbs increments are small enough in the most situations. Occasionally, some people run into issues with the adjustment. The most common one I've heard is that an unselected plate will stick onto the dumbbells when taking them out of the cradle. This can usually be avoided by making sure to lift the dumbbells straight out of the trays, not at an angle. If that fails, you can jiggle the dumbbells before lifting them out. Another issue I've heard of is that the knob sometimes won't turn or release. Typically, the fix is simple: You just need to push the dumbbells down to make sure the weights are seated ALL the way down in the base. If that still doesn't work, some have said that rotating the plates in different directions can fix the issue. In general, though, it seems like most people experience few if any issues with adjusting. These are very bottom heavy due to the large gap in the plates at the top of the dumbbell. This can make the dumbbells feel unbalanced depending on how you hold them. This is an issue to an extent on any dial-based selectorized dumbbells. For example, the Bowflex 552 have aren't perfectly balanced from top to bottom, but any feeling of imbalance you get from those is very subtle compared to the Universal 445 dumbbells. This is because the gap in the plates so much larger. To avoid or minimize the imbalanced feeling, you'll want to make sure to: 1) Hold them such that the gap-side of both dumbbells have the same orientation in each hand; 2) For heavier exercises where an imbalance could make a difference in your strength or technique, you'll want the heavier bottom sides of the dumbbell closer to the floor, or your body. It does have a noticeable rattling sound. Though, it's really more of the clicking sound, since the plates are coated in some plastic of plastic compound. The handle is mildly contoured; it's thickest in the middle, and very gradually becomes narrower toward the ends of the handle. At just under 1.5 inches in diameter at their thickest point Universal 445 dumbbells are thicker than your typical fixed dumbbell, which are usually just over an inch thick. It'll train your grip more, but it won't be so thick as to impair your exercise performance. The handle material itself is hard plastic, with a red rubberized portion over the majority of it to help with grip and comfort. Many lifters praised this rubber portion as very comfortable. Personally, though, I'm always a fan of some nice knurling on a straight steel handle. The dumbbell length is the same regardless of if you have just the handle, or if you select all of the weight. The same applies to any dumbbell with a similar mechanism. Dumbbell length is 13 5/8 inches long. ​Adjusts from 15-50 lbs per dumbbell. You can adjust in as small as a 2.5 lb increment since the smallest plate is 2.5 lbs and you can add it to just one side. However, this means that the dumbbell will be slightly heavier on one side for some increments. To have perfect balance between the left and right sides, the smallest increments are 5 lbs. The adjustment mechanism is pretty innovative, but at the same time very finicky and prone to damage. You add each plate by placing it over the locking mechanism of the plate in front of it, then turning the plate to the right until you hear it click into place. To remove a plate, you push the button in the center of the plate to unlock it, then turn it left and take it off. When this works, it's pretty cool. However, many people have reported that the locking mechanism in the plates is easy to break. This is probably because they're made of plastic with small moving parts, such as springs, inside. This is unfortunate, since I really like the concept behind this, since it allows the dumbbells to look and feel so much like fixed dumbbells. The dumbbell ends are completely flat thanks the adjustment mechanism, described above. There are no trays for this dumbbell set; they wouldn't really make sense with this type of system. Instead, there is a dumbbell stand sold separately​, which holds the dumbbells by the inside of the handle, making it easy to change the weights on the outside of the handle. The stand also holds the unused plates. It also has a holder for an ​EZ bar handle that's compatible with the plates and is available separately​. The dumbbell has a variable length, getting longer as you increase the weight. The dumbbell length is just 9 inches at its lightest setting of 15 lbs, and 14.5 inches at 50 lbs. These are very compact as far as adjustable dumbbells go. The plates to rattle and clink together somewhat during use. The handle is straight and has a rubberized material over the entire grip area. Unfortunately, the material that makes up the inside of the handle is plastic tubing with a hard plastic core running through it. And it seems the plastic core stops right at the start of the first plates, instead of going all the way through it. These cheap materials and poor handle design makes it a major weak point. People have complained of the handle being broken through shipping, and others have had it break after using them. A steel handle that's somehow welded to the first plates (instead of a plastic connection) would have been a much better choice. The diameter of the handle is 1.25 inches thick, which is very similar to the thickness of a typical fixed dumbbell. There is 6.5 inches of space on the inside of the handle. It is expandable beyond 50 lbs per dumbbell. 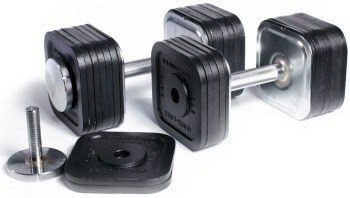 Since the set comes with weights for two dumbbells, you could add all the weight onto one handle for a total of 85 lbs. Technically, you could add even more weight if you had more plates. However, in addition to the Rocketlok dumbbell being hard to find online nowadays, the add-on plates are also nowhere to be found. You might be able to contact the company directly. Each dumbbell adjusts between 15-50 lbs. Adjustments are in increments of 5 lbs. Every weight setting is equally balanced between the left and right side. You can't get 2.5 lb increments by adding an extra 2.5 lbs to just one side, since it's not designed to have each side adjusted independently. Includes trays for storing and adjusting the dumbbells, as well as a dumbbell stand that holds the trays at a convenient height. These dumbbells change weight rapidly via a twisting handle selectorized adjustment mechanism. 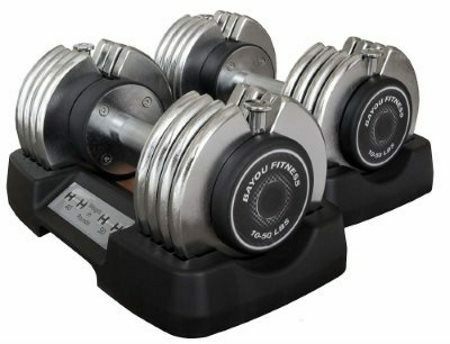 You just rotate the handle to the desired weight setting while the dumbbells are seated in their trays. Then you remove them. Compare this to other selectorized dumbbells where you have to adjust each side of the dumbbell separately. One other thing to note about the adjustment mechanism is that the main moving parts all metal, which makes it less fragile than other systems that use a lot of plastic pieces. One additional benefit to the Weider SpeedWeight's adjustment mechanism is that it allows for the ends of the dumbbells to be completely flat, since there's no need for a dial. When you have flat ends, you're able to comfortably rest the dumbbells vertically on your thighs when setting up for exercises like shoulder press or bench press. Occasionally, the unselected weights will get caught on the dumbbell as you pull it out of the tray. First off, you should try to pull the dumbbells straight up when removing them to avoid this. If it still happens, be sure to jiggle the weights when removing them to make sure any stuck plates fall stay in the tray. Some people reported there's some rattling of the weights, while others said they didn't clank. In all likelihood, there's probably some rattling, but it's probably minimal and depends on the exercise you're doing and the tempo you're performing it at. The dumbbell handle is very subtly contoured, being thickest in the middle and more narrow toward the ends. However, you could glance at and think it's straight; that's how gradual the tapering is. The handle has a rubberized coating over it for comfort and grip. Some people like this, others say they it could be grippier; one ​customer put baseball tape over the handle area to improve grip. In terms of the handle material under the rubberized covering, I was unable to find out if it's steel or if it's some type of hard plastic composite. In any case, I didn't find any reports of the handle breaking or seeming like it might be a weak point. The dumbbell is extremely long at approx. 18 3/4 inches. That's a full 2+ inches longer than the Bowflex 552, which are already considered to be quite long, and they actually have a slightly higher max weight than the Weider SpeedWeight 100 dumbbells (52.5 lbs vs 50 lbs). These dumbbells were around way before most of the other adjustable dumbbells on the market were. I deciding between these, the PowerBlocks and the Ironmasters, about years ago. It was a tough choice, but I ultimately went with the Ironmasters. Unfortunately, it looks like BodyForce, the maker of the the TITAN dumbbells, may be out of business now. At least, they're no longer selling directly online. Their website works, but their online store is down. It's too bad, because these are well-made heavy duty adjustable dumbbells that would be ideal for many people. I've included them here since you may still be able to find them on Craigslist or Ebay, or if they end up selling them again through their site. Adjusts from 5-65 pounds per dumbbells. They adjust in 5 pound increments. There are no trays for these. These dumbbells are "self-contained", much like the PowerBlocks. As such, they don't need a tray for adjustment. There is an ​optional stand for these to make it easier to pick them up and put them down at a convenient height. It is sold separately. 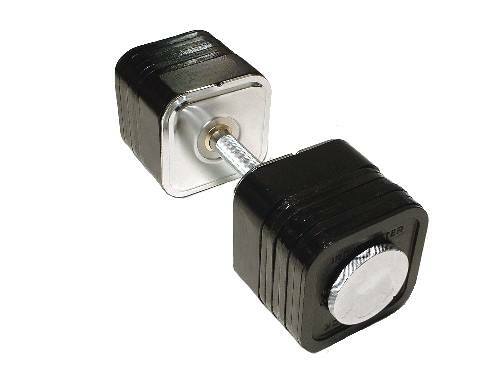 These weights use a knob-based selectorized adjustment mechanism that uses just ONE small knob per dumbbell. You turn the knob until the indicator shows the desired amount of weight. Then you pick it up and begin use. The internals of this mechanism are all metal, making it much more resistant to damage than dumbbells with the moving parts made of plastic. The knob is located on the side of the handle portion, in front of where the weight brackets start; it's not on the end of the weights so it won't get in your way if trying to balance the dumbbells on their ends. Additionally, the knob is recessed below the top of the metal weight brackets, meaning it won't be damaged if you set the weights on that side. Overall, these are very well made. They're manufactured in America. 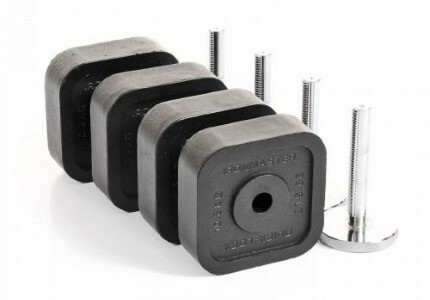 Everything that would be most susceptible to damage in this type of adjustable dumbbell is made of metal, including: the weight brackets, the support rods that go through the plates to select the right weight, and the internal workings of the adjustment mechanism. While dropping them isn't recommended, chances are that it would easily withstand the drop with no functional damage. However, if you were to damage them by dropping them, the warranty wouldn't cover them. Though, the company would offer replacement parts at a reasonable price -- Of course, if they're out of business now, as they seem to be, this warranty doesn't mean anything. The dumbbell handle (including the part that encases the adjustment mechanism) is made of solid high-stress plastic. The part of the handle that you hold is straight, and it has a rubber coating over its entire length to improve grip quality and comfort. Their website claims that an expansion kit that would make the TITAN dumbbells expandable beyond 65 lbs, is "in development". However, if they're out of business, as it appears is the case, then this point is irrelevant. The TITAN adjustable dumbbells have a variable length, meaning they're shorter with less weight and longer with more weight. This gives them a more natural feel during use. They won't hit into your sides, which is the typical problem with the Bowflex-style selectorized dumbbells that are very long even at their lightest weight setting. Each dumbbell is 15.5 inches long at its max weight of 65 lbs. This is very compact for an adjustable dumbbell. 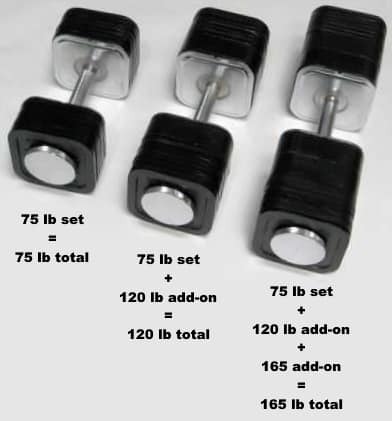 Adjusts from 11-27.5 lbs per dumbbell (22-55 lbs total), IF you believe the max weight stated in the product description. However, from reading the reviews, it seems that the most each dumbbell plate can weight when filled completely with water is about 4.75 lbs. The max number of plates you can fit per handle is 4, if you use the handle extensions. That means the max realistic weights in plates only is 19 lbs (4.75 x 4). Then add 1-2 lbs for the handles, which are made of plastic. That means, a more realistic max weight is around 20 lbs, maybe a little more. The increments can be anything up 4.75 lbs, since you can add or remove as much water weight as you want. You adjust these weights manually by removing the plastic spin-lock piece, adding or removing a plate, then spinning the lock back in place. In terms of filling up the plates with water, the best way is to fill your sink and submerge them until the bubbles stop coming out. Otherwise, you can run them under a thin stream of water from your faucet until full. The only practical purpose I see for these are if you travel a lot and want to do an improvised workout in your hotel room with light dumbbells. When empty the bags take up very little room. And the bars are light and easy to pack as well. That said, if I did a lot of traveling, I'd probably just invest in a TRX suspension training system instead. It's A LOT more useful for improvised resistance training workouts. I believe that the greatest long-term investment is going to be the PowerBlock Pro EXP (with Stage 2 and Stage 3 expansion kits). I believe this so much that I bought them recently. Thus far, they've exceeded my expectations. 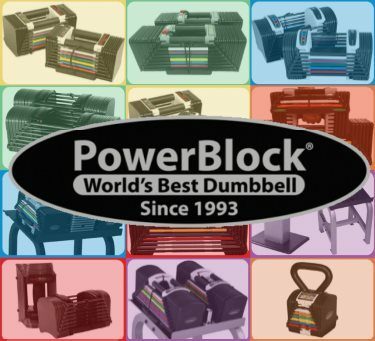 The PowerBlock EXP dumbbells offer excellent weight expandability up to an impressive 90 pounds. Another major draw is their incredibly fast adjustment. You can go from 5 pounds to 90 pounds in literally just a few seconds. Plus, their urethane coating makes them more durable and quieter than the Elite 90. 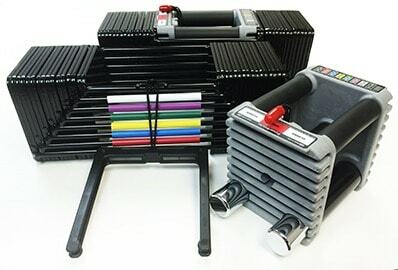 Another big positive is that it's the only heavy PowerBlock set that's compatible with optional PowerBlock accessories like the straight bar, EZ bar and KettleBlock -- all very useful accessories that could add A LOT of additional exercise variety to your training. Lastly, the Pro EXP adjustable dumbbells are incredibly safe and secure. 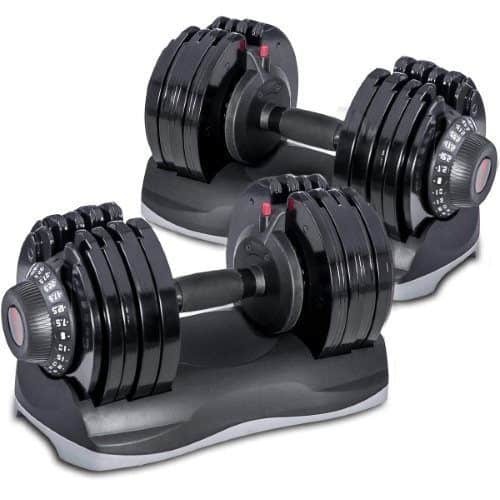 You don’t have to worry about wear and tear, unlike with the BowFlex SelectTech 1090 dumbbells, as discussed previously. So you can rest assured that what you’re buying won't fall apart on you and will last a long time. I have a tie for the runner up: It's the PowerBlock Elite 90 vs. the Ironmaster Quick-Lock Dumbbells. I gave the Elite 90 set their tied-for-second spot because they have all big, important features of the Pro EXP: 90 lbs max weight, 2.5 lb increments and rapid adjustment. However, they're louder and less durable since they're not urethane coated, and they have a closed handle design and lack the v-shaped/wedge cut handle design (less forearm room). Lastly, they're not compatible with the optional PowerBlock accessories (straight bar, EZ bar, KettleBlock). That said, they are also less expensive than the Pro EXP, which is a plus if your budget is tight. 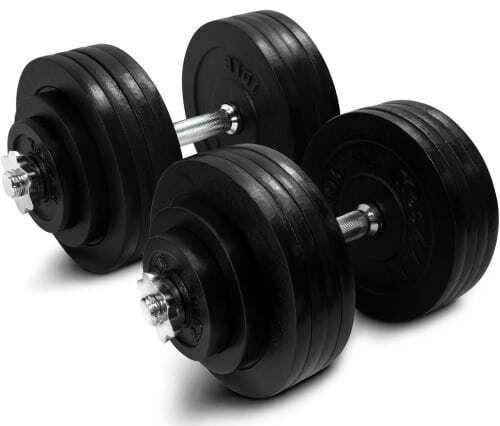 Whereas, the Ironmaster is a better choice for runner-up if you prefer adjustable dumbbells with a more natural look and feel, and that you can get rough with and toss around a bit without worrying about damaging. Another major plus of the Ironmaster is the fact they expand up to 120 lbs with the first add-on kit, and then even higher to a whopping 165 pounds with the second add-on kit. I own the Ironmaster Quick-Lock Dumbbells and love them (though I'm currently storing in my old home gym at my parents house). The main reason why they're contending for the runner-up spot, and are not #1, is because you can adjust the PowerBlock sets noticeably faster. I know that a lot of people in the market for adjustable dumbbells value adjustment speed very highly. After all, that's a major draw of adjustable systems. However, if you're okay with a moderately fast adjustment time (as opposed to rapid) and you prefer a more robust and natural-feeling dumbbell, then the Ironmasters are for you. 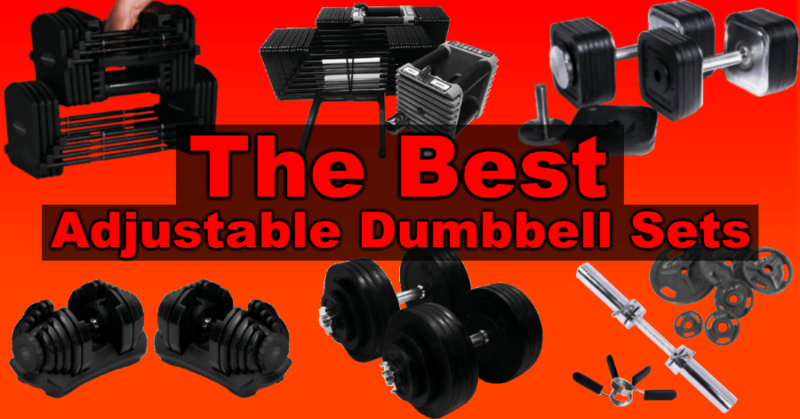 Hopefully my guide has helped you pick the best adjustable dumbbells for your needs. If you're also in the market for an adjustable bench -- as are many if not most of the people buying adjustable dumbbells -- then my guide to the best adjustable weight benches will help you make the right purchase. It's full of advice on features to look for and has several reviews of popular benches.